The lifting contractor had a number of options at its disposal, but ultimately decided that a tandem lift using a Demag AC 160-5 and AC 100-4 all terrain cranes offered the most efficient and cost-effective solution for the customer. The rising popularity of craft beer is a significant boom for local breweries. To keep pace with increasing demand for favorite local flavors, craft breweries are expanding production and storage capacities. This has a trickle-down effect to lifting companies like Action Lev of Calais, France, as the tanks used to store the valued brews require specialized crane equipment to position them with efficient precision. 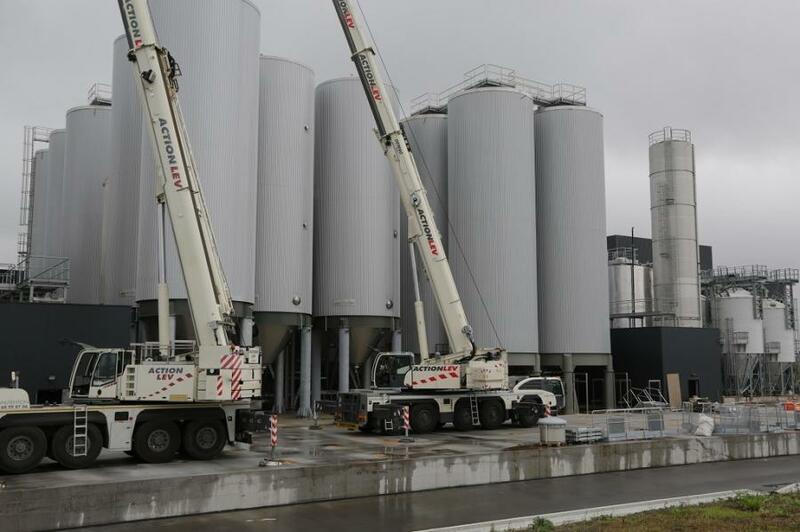 Action Lev recently assisted the craft brewer Goudale, located in Arques near St. Omer in the north of France, to install 24 new tanks for beer fermentation, providing an additional 400 m3 per tank of storage capacity for a total of 9,600 m3. The lifting contractor had a number of options at its disposal, but ultimately decided that a tandem lift using Demag AC 160-5 and AC 100-4 all terrain cranes offered the most efficient and cost-effective solution for the customer. A single crane option for building and installing the tanks was initially on the table. “This plan required unloading the tanks from the trailers and placing them on a raised concrete slab,” said Bruno Declercq, owner of Action Lev, who was also operating the crane. “Thanks to the compact size and maneuverability of the AC 160-5, I was able to set up the crane on the concrete slab in order to reduce the working radius. Otherwise, we would have had to use a crane with a capacity of 700 tonnes to lift them from the outdoor parking area. As is the case with many craft brewers, space is at a premium, and the location of the storage tanks at the back of the building does not leave much room for cranes. The situation was challenging because there was a six meter wide passageway to position two mobile cranes and a convoy requiring a space of six by 30 meters. So Action Lev chose to tackle the challenge deploying a Demag AC 100-4 four-axle crane that was to lift the lower section of the tanks. Its narrow 2.55-m (8.4-ft) width and short 10.64-m (34.9-ft) carrier length make this the most compact all-terrain crane in the 100-tonne (120-US-ton) capacity class. “Even though it is compact, the AC 100-4 still gives us a 50.1 m (164.4 ft) main boom length, which is incredible for a crane of this size,” said Declercq. The crew then set up a 160-tonne (180-US-ton) AC 160-5 crane on the raised concrete slab to handle the new tanks. “This allowed the AC 160-5 to be rigged close to the load's final position, so we could use a smaller capacity crane,” said Declercq. Jean-Christophe Accio said, “This smart solution left the access passageway free for the six meter convoy and the set up of the AC 100-4”. To place the tanks, the AC 100-4 and AC 160-5 cranes required maximum counterweight of 26.1 tonnes (28.8 US tons) and 46 tonnes (50.6 US tons) respectively. In total, Action Lev has set up 56 new 30-tonne tanks in the Goudale Brewery. The largest is nearly 23 m (75.5 ft) tall with a diameter of six meters (19.7-ft). Each tank had to be set up perfectly level on four legs. Declercq used the remote control of his AC 160-5 “to have a better perspective on the legs while placing and leveling the tanks“, said Accio. “Since we were in direct visual contact with the load, the remote allowed us to place the tanks with utmost accuracy," said Declercq. The dual-crane solution employed by Action Lev allowed the crew to cleanly and efficiently place six tanks per day. Including rigging and transport time, crew members completed the project in just three days. The Goudale Brewery was thus able to quickly resume what it does best: brew some of the world's finest beer. Bruno Declercq and his crew will have to return to the brewery at the end of the year to set up eight additional, larger tanks, this time with a diameter of seven meters. A new challenge for Action Lev. Founded in 2001, Action Lev is located in Calais, in the Pas-de-Calais department, and provides all lifting and handling requirements for the neighboring departments. Crane operator by passion, the contractor is surrounded by a qualified staff to be operational on sites that require the use of cranes. The team performs lifting in difficult access areas, industrial dismantling and handling work. Over 17 years of experience has allowed the company to work in all areas of expertise, including industrial, building and event management. The company also offers crane rental and transportation for moving an entire house or boat, among other items. Terex Corporation is a global manufacturer of lifting and material processing products and services delivering lifecycle solutions that maximize customer return on investment. Major Terex brands include Terex, Genie, Powerscreen and Demag. Terex solutions serve a broad range of industries, including construction, infrastructure, manufacturing, shipping, transportation, refining, energy, utilities, quarrying and mining. Terex offers financial products and services to assist in the acquisition of Terex equipment through Terex Financial Services. More information about Terex is available on its website at www.Terex.com, on its LinkedIn page at www.linkedin.com/company/terex and Facebook page at www.facebook.com/TerexCorporation.